Congestion pricing is a quicker, more effective and greener way to reduce congestion at the Rose Quarter than spending $500 million on freeway widening. But the state could achieve the same objective, faster, more effectively and far more cheaply by implementing congestion pricing. Tragically, the project’s environmental assessment didn’t consider that as a possible alternative. But look high and low in the Environmental Assessment and its Traffic Technical Report and you’ll find not a single mention of pricing. In our view, that’s a plain violation of the National Environmental Policy Act, which requires a consideration of a full range of reasonable alternatives. Now in some places, you might be able to argue that congestion pricing is far-fetched or politically infeasible. In Oregon, as it turns out, its neither: In fact, it’s already been adopted as law. Two years ago, Oregon’s Legislature adopted HB 2017, which directed the state Department of Transportation to begin work to implement congestion pricing on Interstate 5 and Interstate 205 in the Portland metropolitan area. In addition, in December 2017, Portland’s City Council voted unanimously to endorse congestion pricing as part of the city’s future transportation planning. Last year, the state transportation department published a preliminary analysis of several pricing alternatives. Among the proposals is one, called “Concept 2” which would extend pricing to all lanes of these two major freeways. Overall, Concept 2 – Priced Roadway, will reduce congestion for all travelers on the priced facility. This will produce overall improvement in travel time reliability and efficiency for all users of I-5 and I-205. 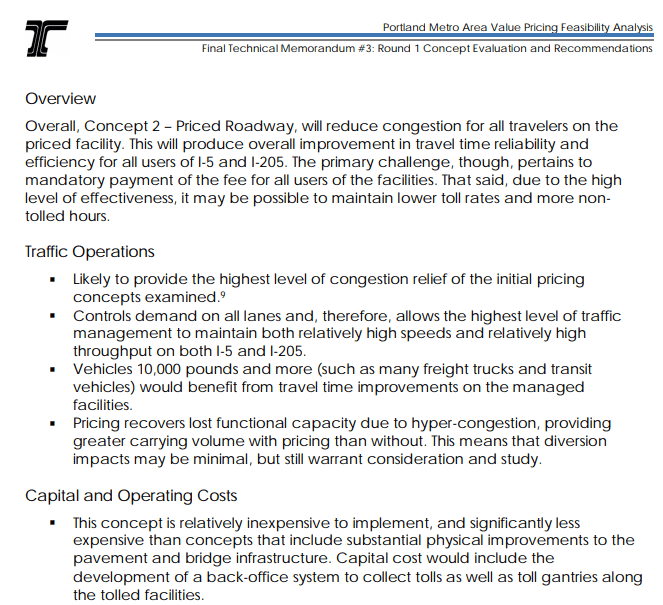 [Concept 2 is] Likely to provide the highest level of congestion relief of the initial pricing concepts examined. [It] Controls demand on all lanes and, therefore, allows the highest level of traffic management to maintain both relatively high speeds and relatively high throughput on both I-5 and I-205. Vehicles 10,000 pounds and more (such as many freight trucks and transit vehicles) would benefit from travel time improvements on the managed facilities. Pricing recovers lost functional capacity due to hyper-congestion, providing greater carrying volume with pricing than without. This means that diversion impacts may be minimal, but still warrant consideration and study. This concept is relatively inexpensive to implement, and significantly less expensive than concepts that include substantial physical improvements to the pavement and bridge infrastructure. Oregon Department of Transportation,, (2018). 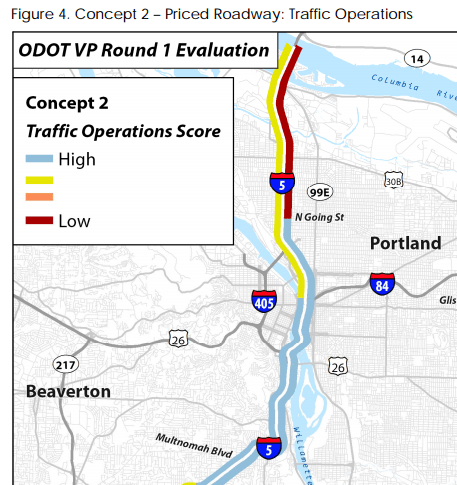 Portland Metro Area Value Pricing Feasibility Analysis Final Round 1 Concept Evaluation and Recommendations Technical Memorandum #3, 2018. Bottom line: congestion pricing works better for freeway users, freight mobility, and transit riders; in keeps unpriced traffic from causing hyper-congestion and effectively and is vastly cheaper than building new lanes and bridges. It is also likely to result in minimal, if any diversion to local streets. This is clearly a viable alternative to widening the freeway at the Rose Quarter. Viable is actually a significant understatement: pricing isn’t simply a viable alternative, it’s arguably, on its face, a superior alternative). But that’s beside the point. From a legal standpoint, not seriously evaluating road pricing as an alternative to expensive, environmentally damaging road widening is violates NEPA’s requirement for a robust analysis of alternatives. 1. Rigorously explore and objectively evaluate all reasonable alternatives and for alternatives which were eliminated from detailed study, briefly discuss the reasons for their having been eliminated. 2. Devote substantial treatment to each alternative considered in detail including the proposed action so that reviewers may evaluate their comparative merits. Alternatives analysis should clearly indicate why and how the particular range of project alternatives was developed, including what kind of public and agency input was used. In addition, alternatives analysis should explain why and how alternatives were eliminated from consideration. It must be made clear what criteria were used to eliminate alternatives, at what point in the process the alternatives were removed, who was involved in establishing the criteria for assessing alternatives, and the measures for assessing the alternatives’ effectiveness. Nothing in the EA describes the criteria used to select or eliminate alternatives, nor is any analysis offered for the the failure to advance pricing as an alternative in its own right. It’s simply arbitrary and capricious of the Oregon Department of TRansportation and the Federal Highway Administration to produce an Environmental Assessment which takes no notice of efforts they are both currently undertaking to implement road pricing on this very roadway. Moreover, while NEPA requires that congestion pricing be evaluated separately as an alternative, it is also the case that road pricing ought to be incorporated in the analysis as part of the No-Build alternative. The implementation of road pricing in the next decade or so is, in NEPA terms, a reasonably foreseeable event. Just as the Environmental Analysis has incorporated its expectations about the growing electrification and increased fuel efficiency of future vehicles in its forecasts of emissions (due to the future implementation of fuel economy regulations), it should likewise include the analysis of congestion pricing, which is also a reasonably foreseeable part of the regulatory environment in the next decade or so. It’s likely that implementing road pricing would obviate entirely the need for capital construction at the Rose Quarter. But even if it didn’t, it is far more prudent from both a fiscal and environmental standpoint to implement congestion pricing first, to determine which, if any, “improvements” are needed at the Rose Quarter to reduce congestion and improve safety. The “build first-price later” strategy is a recipe for squandering scarce public resources on roads that people don’t value and won’t use. As we chronicled at City Observatory, Louisville spent a billion dollars adding capacity to its I-65 bridge over the Ohio River, only to discover that traffic volumes fell by almost half when they started charging a modest toll to bridge users. It’s financially, as well as ecologically prudent to toll first, and then invest in capacity, when, were and as needed, only later. Major cities around the world have implemented various forms of congestion pricing, with strongly positive results. The London Congestion charge is well-known. Pricing systems are up and running in Stockholm, Singapore and Milan. Once established, the systems generate strong public support because they make urban traffic flow more smoothly. Systems in Milan and Stockholm were both endorsed in city-wide public referenda after being established. New York seems finally, to be on the verge of approving congestion pricing for lower Manhattan.